iPastries will certainly raise your idea of what quality pastries and desserts should be in the Coachella Valley. Until now, fresh, hand-crafted delicacies have rarely been available. 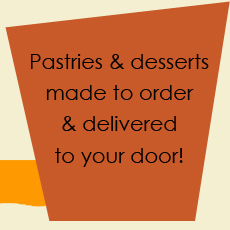 iPastries has now filled that void by opening a large, new, local facility which will custom-make all orders and promptly deliver them free of charge to your door (minimum purchase required). Founder and head chef, Jocelyn Lee Shoopman has spent over 25 years in the bakery business, many of those as Executive Pastry Chef for a major hotel chain. Over the years she has won numerous awards which have recognized and honored her special baking abilities. Jocelyn's passion for producing gourmet-quality pastries and desserts will be evident once you've tasted her exceptional products. Serving them will be an elegant finale to any fine occasion.